For a clean Chesapeake Bay. The Chesapeake Oyster Alliance is a coalition of non-profits, community organizations, oyster growers, and others committed to adding 10 billion new oysters in the Bay by 2025. It is only with a healthy Chesapeake oyster population that a restored Bay is possible. The Alliance will improve water quality, engage new constituencies, and drive economic benefits across the region. 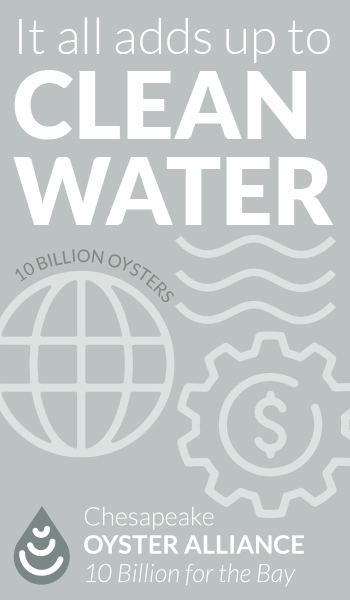 Why Do We Need 10 Billion Oysters? Oysters are crucial to a healthy Bay and strong economy, but the current population is just a tiny fraction of its historic size. Chesapeake Bay oyster restoration progress has been accelerating. But without an ambitious collaborative effort we will likely fall far short of truly restoring this keystone species. Maryland and Virginia's economies have lost more than $4 billion in the last 30 years because of the decline in oysters. Oyster reefs stabilize shorelines, reduce nutrient pollution, and provide crucial habitat and food for crabs, fish, and other Bay critters. Oysters could once filter a volume of water equal to that of the entire Bay in a week. With their dwindled numbers today, it would take more than a year. Maryland and Virginia have committed to restoring the oyster population in five tributaries in each state. The alliance will work to ensure that funding is available and that both states are on track to meet those goals. At present, restoration programs are planting roughly 1 billion oyster spat annually. Because more than 75 percent of the Bay's oyster bottom is open to commercial harvest, better management of these reefs is essential. Science-based management, using real-time data on oyster bar health to determine when to open and close bars to harvest, should be employed with a goal of substantially increasing the number of oysters that are maintained on public bars. Oysters raised through aquaculture provide many of the same benefits to the Bay as wild oysters. While Virginia has a thriving oyster aquaculture industry, which has recently surpassed the catch of wild oysters, Maryland has been slower to adopt aquaculture. The alliance will work to increase production in Virginia and provide additional support to increase oyster aquaculture in Maryland. 50 A single adult oyster can filter up to 50 gallons of water a day. 6,000 Roughly 6,000 baby oysters are produced with a bushel of recycled oyster shell. 20 Oysters can live as long as 20 years. 150 Scientists have been doing research on oysters in the Chesapeake for almost 150 years. Successfully restoring the Bay's oysters requires a combination of restoration in sanctuaries, science-based fishery management, and increased aquaculture. Photo Credits: 1. Robert Diller, 2. Jake Newberger, 3. Carlos Roldan.